Review copy provided by publisher, thank you! "Every so often that story comes along that reminds us of what it’s like to experience love for the first time—against the odds, when you least expect it, and with such passion that it completely changes you forever. An unexpected discovery takes eighty-four-year-old Lily Davis Woodward to 1945, and the five days that forever changed her life. Married for only a week before her husband was sent to fight in WWII, Lily is anxious for his return, and the chance to begin their life together. In honor of the soldiers' homecoming, the small Georgia town of Toccoa plans a big celebration. And Jake Russo, a handsome Italian immigrant, also back from war, is responsible for the elaborate fireworks display the town commissioned. But after a chance encounter in a star-lit field, he steals Lily's heart and soul—and fulfills her in ways her socially-minded, upper-class family cannot. Now, torn by duty to society and her husband—and the poor, passionate man who might be her only true love—Lily must choose between a commitment she's already made and a love she’s never known before." A very impressive debut for this author from Georgia as he writes about a girl from Toccoa, Georgia. He writes with ease, and the words flow fast with a rhythm that traps you within the heart of the story. The story is Lily. Lily is now a grandmother who is recounting her life choices to her granddaughter as she is on the brink of making a mistake by marrying the wrong guy. After keeping silent for more than fifty years, Lily tells the story of a few days that changed Lily's path forever, in hopes that her granddaughter learns from the wisdom of her years. Lily tells this story with passion, about her first love, her marriage to the boy who went overseas within two weeks of their marriage. Three years goes by without seeing her husband, and Lily becomes a stranger to herself, to her husband, to her family, and Lily is seemingly on the outside looking in. Of course, no one notices this but Lily. The town of Toccoa that Lily and her family is a very big part of waves at Lily incessantly as she drives through the town, every day, for years, day after day, and just days before her husband is due to come home after three long years. This is technically a love story, a story of romance and sudden whim and the forces of society that are pressing in all at the same time. As Lily struggles with her feelings, we as a reader are privy to that struggle as we witness the contemplations that Lily is having. They are not glazed over, they are the myriads of conflicting emotions that go on for pages and pages but still capture your attention with every painful yet hopeful word. "Lily found herself wondering what would have happened if she had never gotten out of her car to walk into that field and never met Jake Russo. What if the arbitrary winds had sent a friend walking to her on Doyle Street, delaying her and keeping her from seeing the firework?" Lily did see the firework, the firework that was so rare in those days of World War II. Lily did walk towards it, and she met Jake Russo, the fireworks man. And her life- her heart and soul- were changed irreparably forever after. Her husband was on his way home to his wife, and his wife was falling in love at first sight with another man. Worse yet, the other man was an Italian, who was on the other side of the war as far as the war was concerned. Lily experiences a series of emotions throughout the few days that the book comprises, and we witness them as if the writing is almost a stream of consciousness style of story telling. It was gripping, twisting and off-putting. Lily was obviously doing the wrong moral thing, and the wrong social thing, as she was falling in love with Jake Russo, the fireworks man. I still could not help but to root for her and for the allusive thing that is true love. I enjoyed the supporting characters, each one being its own subtle force within Lily's character, from Lily's parents, her dead brother, the town of people. 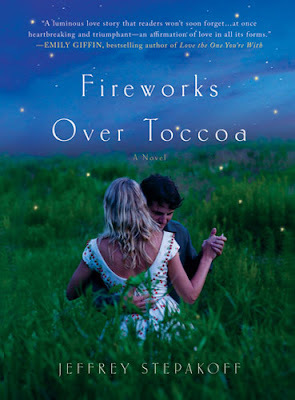 As the story winds down, and it is a shorter novel than many, disaster strikes and everything collides much like fireworks and I was very emotionally attached to Lily and what ultimately happened to her and her loved ones that we came to know. A powerfully impressive story that I would recommend to those who believe in the blessing and tragedy of love.